The spectacle of gladiatorial combat was initiated by wealthy Romans over 250 years before the birth of Christ as a part of the ceremonies held to honor their deceased relatives. Later, these games became separate events sponsored by Rome's leading citizens in order to enhance their prestige. With the decline of the republic and the rise of the empire, gladiator games were appropriated by the emperor. The primary purpose of these life-or-death duels was to entertain the multitude of spectators that jammed the arena. Although some freemen elected to live the life of a gladiator, the majority were slaves, captured during the numerous wars Rome fought to expand its territory. The prospective gladiator received extensive training and became proficient in a particular mode of combat and the use of specific weapons such as the sword, net or the three-pronged spear known as the trident. The games began early, lasted all day and were usually divided into three presentations. The morning was devoted to the display and slaughter of animals, many of them exotic beasts gathered from the far reaches of the empire. Lions, elephants, giraffes and other rare animals all played a role in a display of butchery designed to advertise the diversity of the far-flung empire and Rome's mastery of Mother Nature. The morning session was followed by a lunch break in which patrons could leave the arena to satisfy their hunger. Those who lingered were entertained with the execution of common criminals. An attempt was made to match the method of the condemned person's death with the crime committed. Those who had murdered were thrown unprotected to wild beasts. Those who had committed arson were burned alive. Others were crucified. Criminals also provided the fodder for entertainment in the reenactment of historic naval battles in which the arena was flooded and the condemned forced to play the role of the doomed crews of enemy ships. The afternoon was devoted to the main event - the combat of the gladiators. 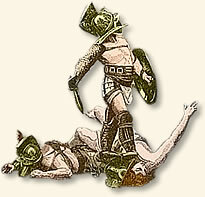 Typically, gladiators with different specialties were pitted against one another. Much like a modern boxing match, the duels were governed by strict rules and overseen by a referee to assure these rules were followed. Music provided an accompaniment with the band varying the tempo of its play according to the action in the arena. The crowd would ultimately decide whether the loser would live or die. "There is nothing so ruinous to good character as to idle away one's time at some spectacle. Vices have a way of creeping in because of the feeling of pleasure that it brings. Why do you think that I say that I personally return from shows greedier, more ambitious and more given to luxury, and I might add, with thoughts of greater cruelty and less humanity, simply because I have been among humans? The other day, I chanced to drop in at the midday games, expecting sport and wit and some relaxation to rest men's eyes from the sight of human blood. Just the opposite was the case. Any fighting before that was as nothing; all trifles were now put aside - it was plain butchery. The men had nothing with which to protect themselves, for their whole bodies were open to the thrust, and every thrust told. The common people prefer this to matches on level terms or request performances. Of course they do. The blade is not parried by helmet or shield, and what use is skill or defense? All these merely postpone death. In the morning men are thrown to bears or lions, at midday to those who were previously watching them. The crowd cries for the killers to be paired with those who will kill them, and reserves the victor for yet another death. This is the only release the gladiators have. The whole business needs fire and steel to urge men on to fight. There was no escape for them. The slayer was kept fighting until he could be slain. 'Kill him! Flog him! Burn him alive!' (the spectators roared) 'Why is he such a coward? Why won't he rush on the steel? Why does he fall so meekly? Why won't he die willingly? " Unhappy as I am, how have I deserved that I must look on such a scene as this? Do not, my Lucilius, attend the games, I pray you. Either you will be corrupted by the multitude, or, if you show disgust, be hated by them. So stay away." Seneca's account appears in: Davis, William, Sterns, Readings in Ancient History v. 2 (1913); Wiedman, Thomas, Emperors and Gladiators (1995). "Gladiators, 50 AD," EyeWitness to History, www.eyewitnesstohistory.com (2005).